Press releases and ads for the Orlando Mini Maker Faire mentioned “Rockets!” (with the exclamation mark). But, the web site for the event did not explain what kind of rockets. So, I attended the event expecting to see water rockets or whatever. But, a pleasant surprise awaited me as I entered the Maker Faire’s building at the Central Florida Fairgrounds. Backing up … (how’s that for building up the suspense?) 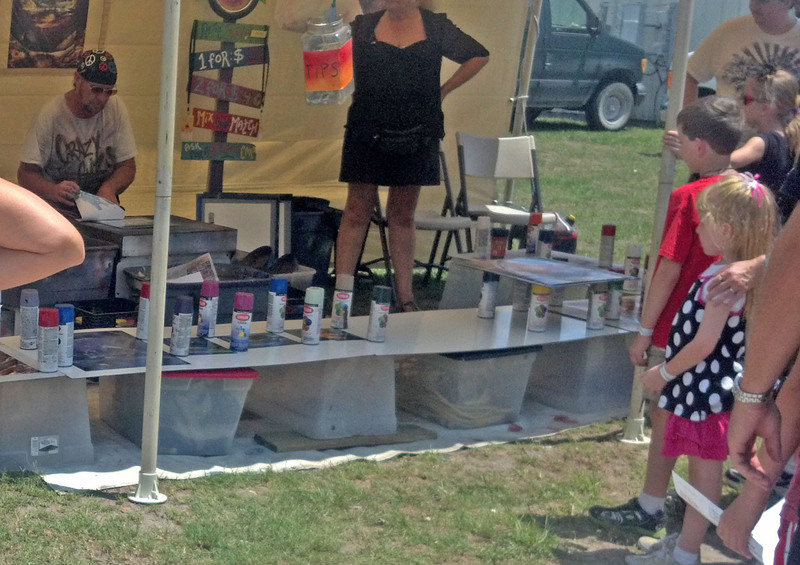 … Maker Faire is sort of a cross between an arts and crafts fair and a science fair. The organizers describe it as “a two-day, family-friendly festival of invention, creativity and resourcefulness, and a celebration of the Maker movement.” Sponsored by Make Magazine, Maker Faires have been held in several large cities. 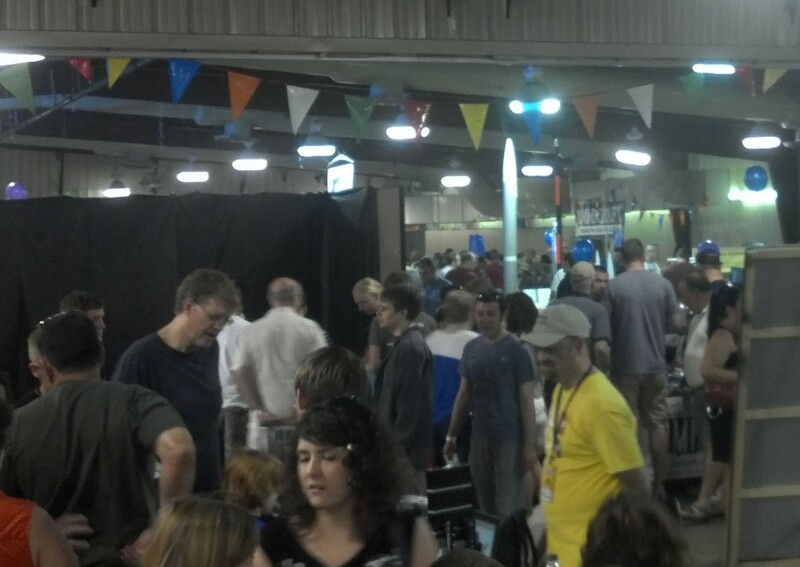 A “Mini Maker Faire” is a smaller, community-organized version of Maker Faire. 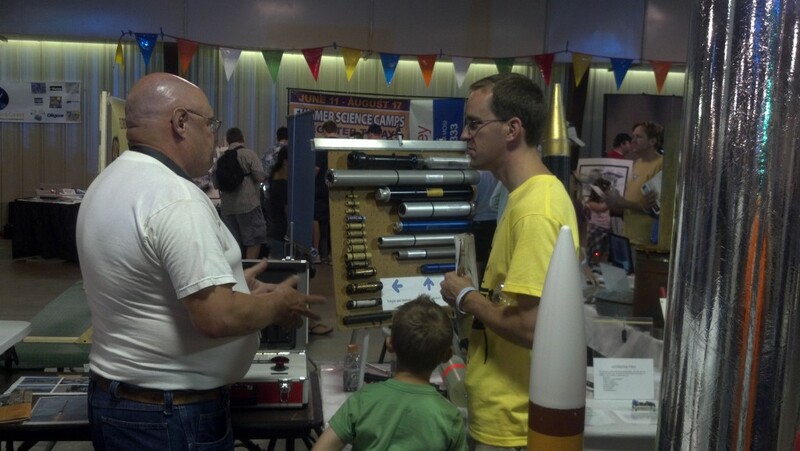 Orlando’s one-day Mini Maker Fair was held at the Central Florida Fairgrounds on May 26, 2012. The Orlando event seemed to attract a decent-size crowd. I purchased my ticket online, saving a couple bucks off the $10 admission charge. At the entrance, a volunteer used a smart-phone to scan the ticket I had printed at home. I received a wrist band and a printed guide to the exhibits. One of the first exhibits inside the Maker Faire area featured an artist creating spectacular paintings using paint from spray cans. I have little doubt that he inhaled almost as much paint as he applied to his canvas. I watched for a while until the fumes began to make me dizzy. Water rockets that I had expected to see. 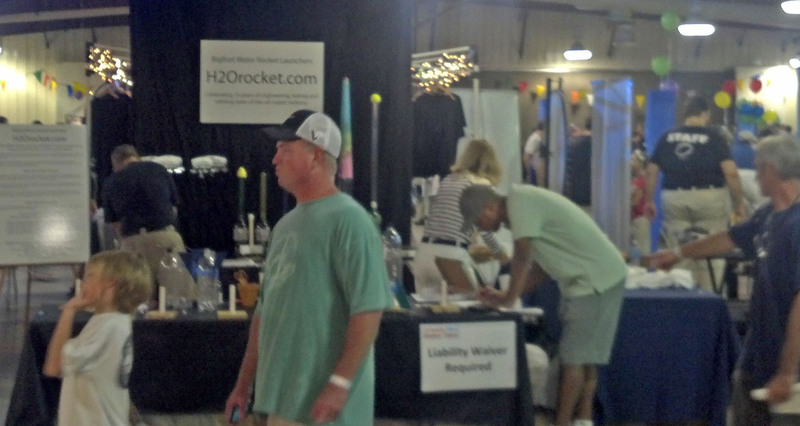 H2ORocket.com exhibited a collection of cool water rockets and launchers. As I looked over their display, I noticed something interesting in the distance. Hmm? What is that sticking up above the crowd. I had to go look. 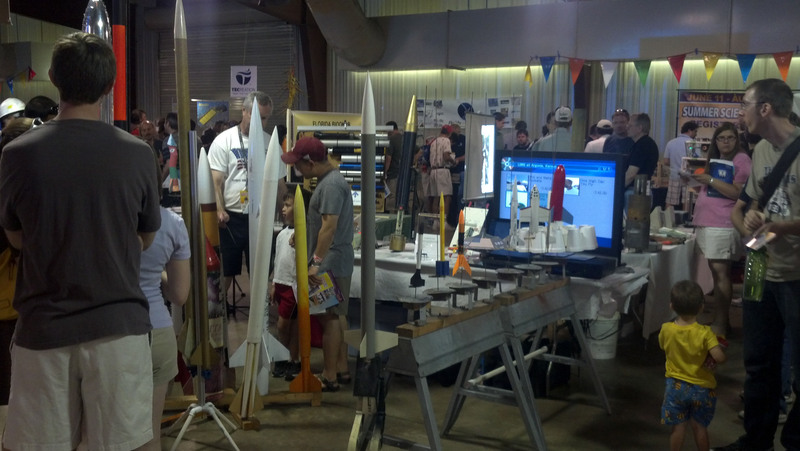 Tom Tweit displayed a selection of his rockets, from small model rockets to the large rocket he built for his Level 3 certification attempt. Tom included a display of rocket motors, showing the relative size of motors from a Quest 1/8A MicroMaxx motor to a 54mm CTI K motor. He also had a list of local rocket clubs that he was handing out to interested people. And, yes, that is an Estes Dude on the right. Assured that Tom was doing a great job promoting our hobby, I decided to look at some of the other things on exhibit at Maker Faire. But … first … let me apologize for the poor quality of the photographs. I took the photos with my Motorola Droid smart phone. It’s a great phone that takes terrible still photos. 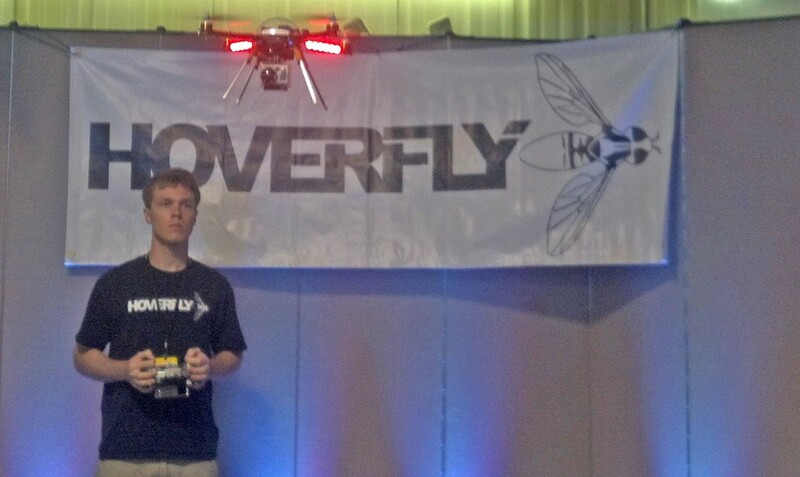 Near Tom’s booth, I watched Hoverfly Technologies demonstrate their “quadcopter” aerial video system. Yes, I want one. 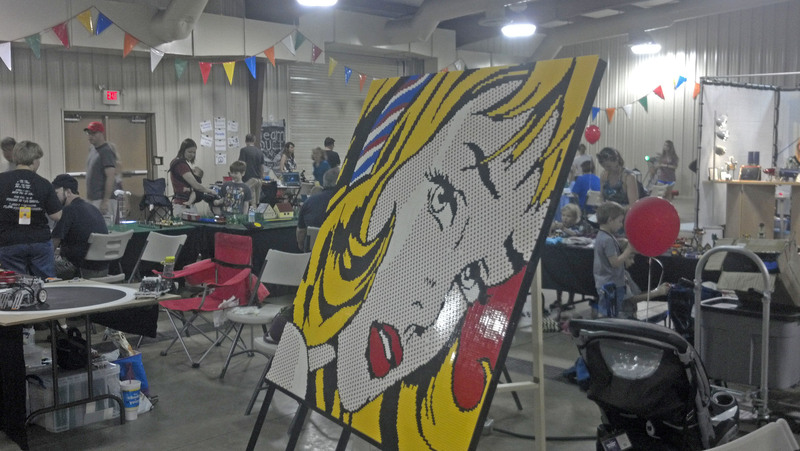 Lego creations filled a large area of the exhibition hall – from artwork to trains. There was even a computerized machine which built things using Lego building blocks. Several tables were devoted to allowing kids to build things. 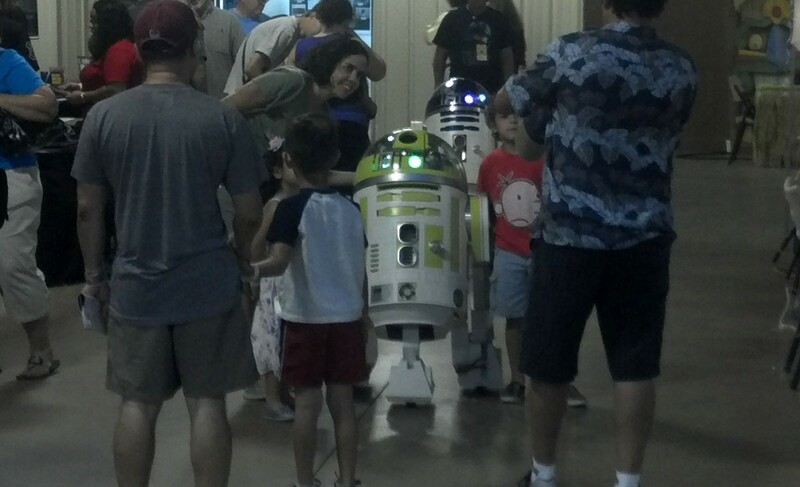 I spotted many robots – some greeting visitors, others completing tasks such as shooting a basketball into a hoop. The Orlando Science Center had a large exhibit featuring a Tesla coil producing dramatic sparks in tempo with music played on a synthesizer. Florida Motion and Control’s exhibit featured servos and switches and lots of other stuff. But, what caught my eye was the 80/20 t-slot aluminum rails. I joked that “I didn’t know those were used for anything other than launching rockets.” The “FloMoCo” representative didn’t miss a beat. He picked up an 80/20 brochure and showed me that the company had included rockets in their ad literature! Disappointed that I couldn’t stay around for Tom’s static motor demonstration, I headed outside. I took a few minutes to look at the electric cars on display. Some were commercially manufactured as electric vehicles. 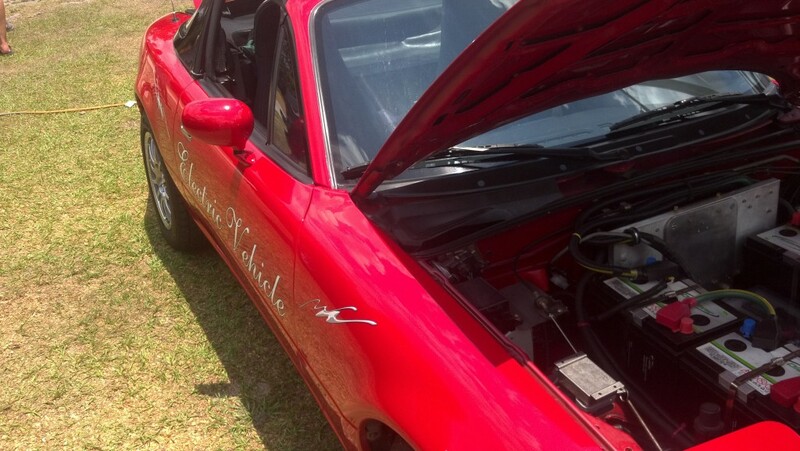 But, many, like the Mazda Miata above, were converted from gas-powered cars. Then … I headed to my old-fashioned gas-powered car for the drive home.